This Trigger Action treasure is a rarity from Red Deer. 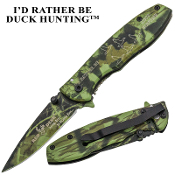 A super sharp addition to your hunting gear, this item is one of a kind in that it is perfect for the tasks that go along with being in the outdoors. Anything from cutting paracord to skinning a game animal, these knives are more than up to the task. The green camo finish is a great look and goes great with any camo shirt or apparel. Razor sharp stainless steel camo blade. Handy pocket/belt clip. Spring Assisted Opening - A simple nudge of the thumb stud and/or index engages the opening action. Strong springs take over and ensure that the blade opens lightning fast and "snaps" into place. The frame locking mechanism with thumb grip release keeps it firmly locked in place. Very high quality construction utilizing torx screws and steel components. Theme: "I'd Rather Be Duck Hunting"